Attempting anything new is always a risk. We risk being vulnerable. Feeling exposed. We risk getting it ‘wrong’ and feeling uncomfortable, or at worst having to battle the dreaded, loathsome enemy – shame. Shame is a such a visceral, pervasive emotion. It can appear in an instant, usually when we find ourselves at the mercy of someone else’s reaction. It gets us in the gut. Coats us in a slimy film. It has the power to diminish us in seconds. In a blink we can transform from a functioning grown-up into a very small person longing to be smaller, or even more effective – invisible. Shame is often rooted in our ancient histories (early school experiences; mocking reactions from our peer group or adults; in the most serious cases – abuse) but a present day reminder can trigger instant recall, and we end up tangled in a destructive loop. Some people go to great lengths to avoid ever being in that position again, and their lives shrink considerably as a result. I have never been a natural risk taker. You won’t find me bungee jumping or balancing on a narrow edge. As a child, I was even scared to walk down a steep hill. I was afraid of being hurt or looking like a fool. Some of us just are. 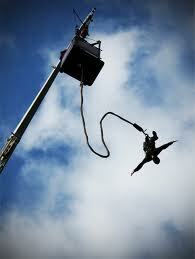 But I am learning to find alternate ways to bungee jump. I am risking breaking the loop in order to try things out. I am dipping my toes into waters I previously judged far too icey. The rewards, as I am discovering, are golden. I’m becoming more resiliant and that feels like warm relief. It is not a simple process. Many of us are very entrenched in the habits and ways of being that we have constructed to keep us feeling protected and safe. But ironically, many of us also feel imprisoned by those same security measures. It takes time to bend the bars. Begin here. Think about an experience where you felt overcome with shame. How did you react? What were you left with after it had all unfolded? Stay with the feelings. Be specific. Now write a letter to the people or person who you feel contributed to that shame response in you. Don’t hold back. Write in BIG BOLD LETTERS. Allow your words to SHOUT. Tell your truth. When you are finished – rip it up, or better yet – put it in an envelope (if you still have one!) Write whatever you wish to on the front, and take it to a post/mail box and slip it through the slot. Or leave it on a table at Starbucks. Or propped in a tree branch. Or on the bus. Or on a bench. Notice how you feel as you walk away.